Last edited by Sugakooky; 09/23/18 11:34 PM. Usually one day isn't enough time to assess what is going on in a new home, however, let's see. How old are these new little ones? That could be very important. Do they shake all the time when they are out of their pouch or just for a little time until they wake up and get their bearings? Let's start with these answers first. One is a 2 month old and the other is a 3 month old. They are not siblings and they shake most of the time after they've gotten their bearings. The food is all gone the next morning, though I think one eats most of the food shakes the most. Last edited by Sugakooky; 09/25/18 12:08 AM. What diet are they currently on? I think we need to move this to our Health & Hygiene forum to continue this discussion. 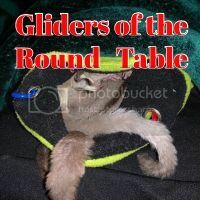 Dawn has asked what could be a very important question because it is essential for gliders to have a well balanced feeding plan. What were they being fed when you got them? Who did you get them from? A full time breeder or a hobby breeder? Is it possible to get a video of their movements? I was told they were on tpg diet and I switched them to the bml diet. I think the breeder was a hobbyist. I will try to get a video tonight! BML is a good diet if they are eating it all. So there should be no problem there. Will wait for the video to see if that shows us anything. First, thank you very much for the video. I want to address the issue of their age. I don't know if the glider in the video is the one you consider two or three months, but it really doesn't matter because to me that one appears to be a full grown glider not a joey. I would imagine since you got them both from the same person, the other one looks pretty much the same. That being said, there is no way of knowing how old they really are. The shaking to me looks more like they are probably a little scared and still getting used to their new surroundings. Just a bit unsure of where they are yet. If I am correct about their being full grown rather than joeys, it is possible the previous owner had them for some time. Now, do you know what gender they are, just out of curiosity? Oh ok, I've been worried if maybe something was wrong with them. Thank you! Both of them are girls, or at least I haven't seen a pom on them to think one of them was a boy. I agree with Karen, it looks like the critter is just nervous & trying to figure you out. Mine look like that if they get spooked by a loud noise ...or paper bag ...or trash bags. Mine still do this once in awhile.